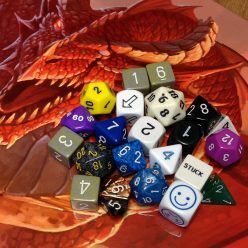 Cars, trucks, tanks, spaceships, pirate sloops… there are dozens of kinds of vehicles in adventure fiction, and given their size and their power, it may be a challenge to see where vehicles actually fit in a role playing game setting. Here are three ways of looking at vehicles in your Domino Writing-style USR game. 1. Vehicles as narration: In most settings, a vehicle is just a means to an end, a way to get from one place to another. In a modern-day action story, the characters drive fast cars or ride in helicopters, but only because it gets them across the city quickly, and to the next story point. There’s no game rules when using a vehicle as narration; you can just say, “The heroes hop in their cars and get to the police station,” or even “The heroes get on horseback and arrive at the entrance to the dungeon in about an hour.” It doesn’t matter how fast they’re traveling, or what happens on the trip, only that they are traveling. 2. Vehicles as equipment: The flexibility of Specialisms in USR means it’s easy to make a vehicle a piece of gear, just like a weapon or a special tool. 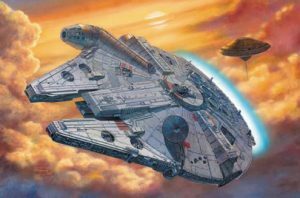 Some characters who are closely linked to their vehicles might include the vehicle as one of their Specialisms (for example, Han Solo with his Millennium Falcon +2, or Jack Sparrow and the Black Pearl +2). A game master could provide a vehicle as equipment if it’s going to be integral to the story, and more than just narration; for example, the Enterprise could be a +2 Specialism to everyone on the “Star Trek” crew. It wouldn’t be a Specialism just for Kirk or Picard, because all of the heroes in the adventure make use of the Enterprise — as a weapon, as a research station, as a place of healing, and so on. Of course, Han Solo and Jack Sparrow have plenty of adventures not on board their ships, but no one else in their stories is so connected to those ships as they are. Like weapons and armor, vehicles can be classified as “light” +1, “medium” +2 or “heavy” +3. A +1 vehicle could be a motorcycle or a horse, while a +2 would be a car or space fighter (an X-Wing or Viper), and a +3 vehicle could be something massive, like a semi-truck, a tank or the Enterprise itself. Also like weapons or armor, you don’t need a separate Specialism for Pilot, Driver or Vehicle Gunner, unless that’s really a core element of a character. The vehicle Specialism includes its flying and shooting capabilities. The Specialism would be used in any situation the vehicle could provide help — winning a race, carrying a heavy load, or firing its on-board weapons. If the vehicle is seriously damaged, it ceases to be a usable Specialism, until it’s repaired. 3. Vehicles as characters: Some settings are all about their vehicles: Mad Max, Mobile Suit Gundam, even Transformers. In those settings, the single bonus a Specialism provides doesn’t really offer enough to accurately represent the vehicle. So you can add more statistics to a vehicle, like top speed, armament, and maneuverability. Rules for that are in Somnium Void, starting on page 23. We’re taking a week off from USR Wednesdays next week, but we’ll be back after that for a look at more genres. How do you use vehicles in your game?